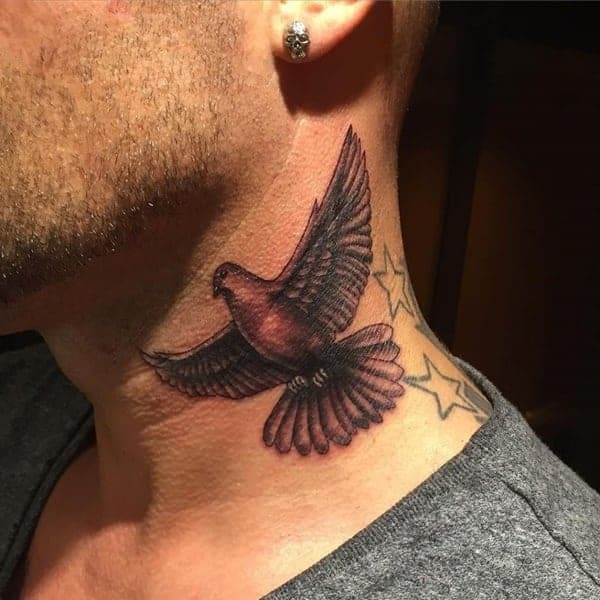 If you are looking for a tattoo that is not only amazing but inspiration as well then you must get the dove tattoo. 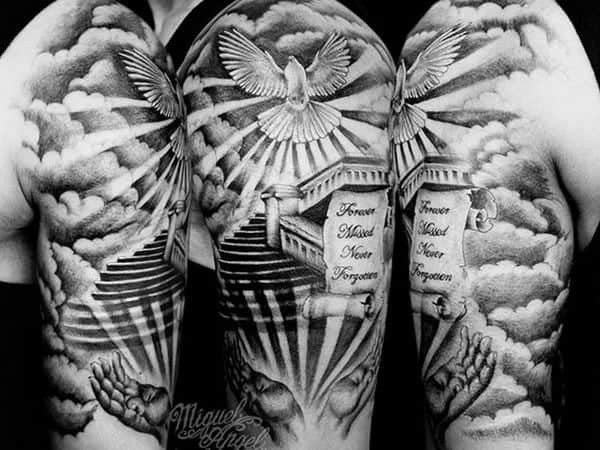 These tattoos are often beautiful expressions of faith and you won’t find a more creative tattoo. 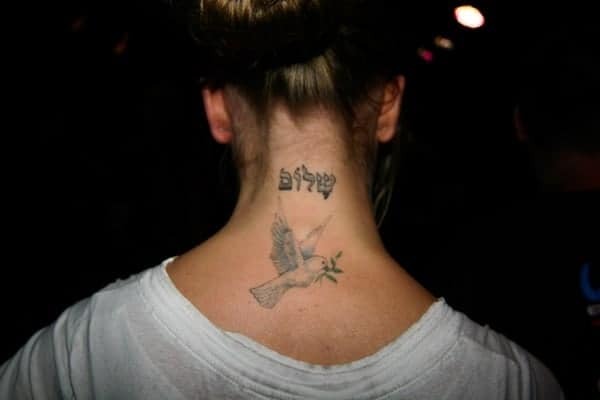 No one can ever hate a dove; they are considered to be peaceful creatures and very beautiful ones. 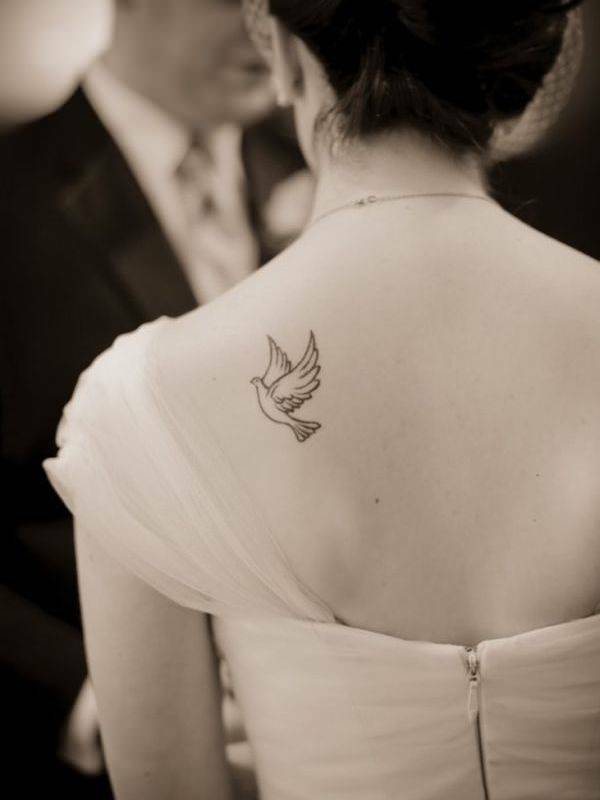 The dove is a globally loved creature, so much so that people will often release them at their wedding. 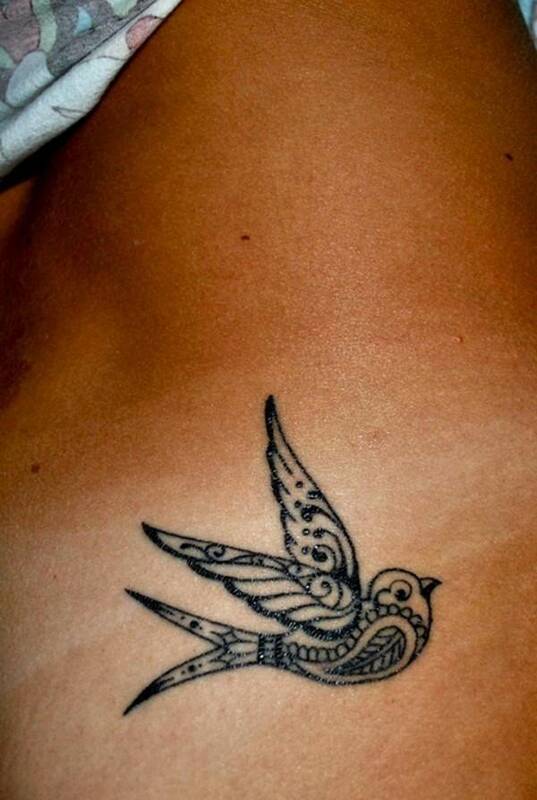 The dove is not only considered to be a pretty bird but it’s also a symbol of peace so how can you not love the bird. 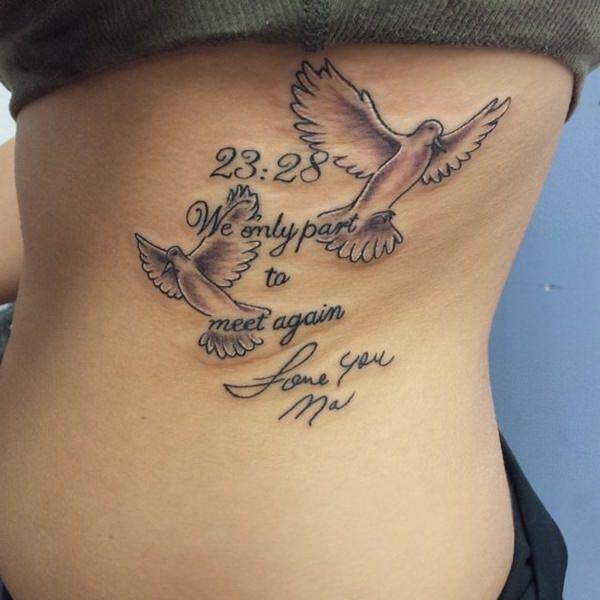 It’s a great tattoo image for that reason alone. 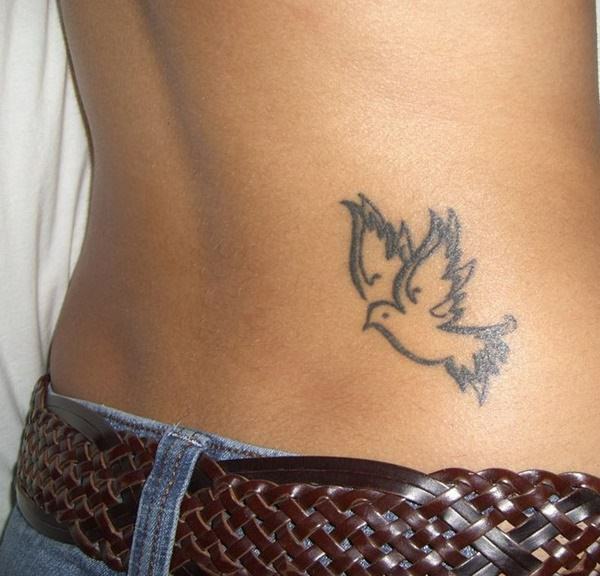 The dove is a symbolic image, and it often means peace, harmony and affection. They have a look of innocence to them because of the white coloring. 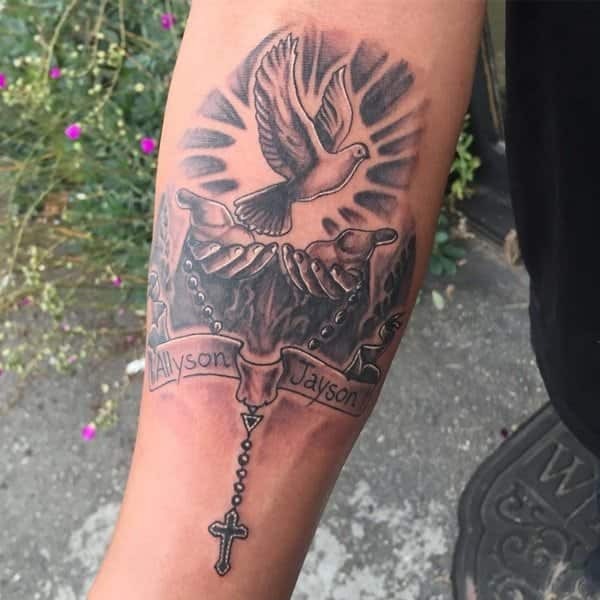 The meanings behind the dove are why people get them and they are sometimes associated with loved ones who have passed on. 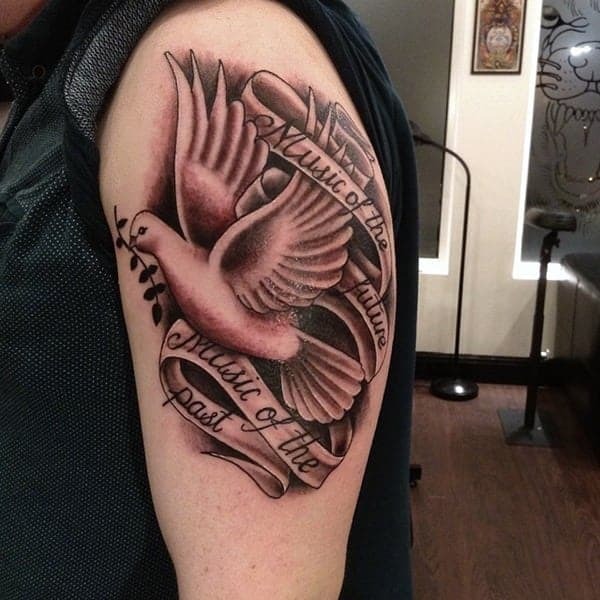 A great design that is spiritual in nature with the doves off to the side. 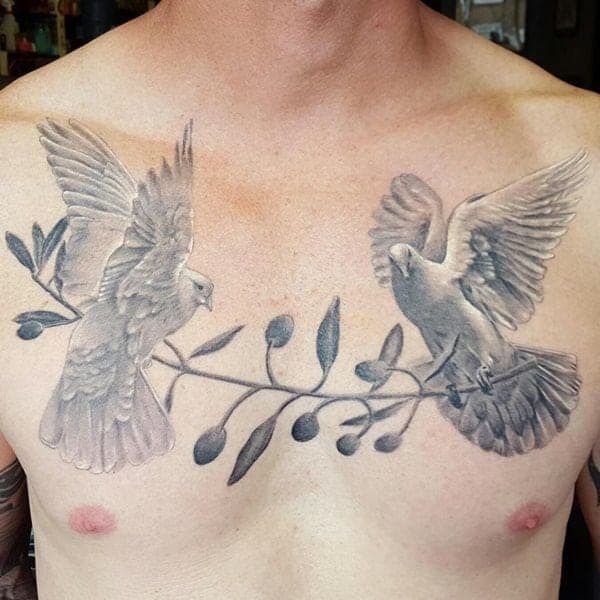 A gorgeous tattoo design of a couple of doves that look like drawings. 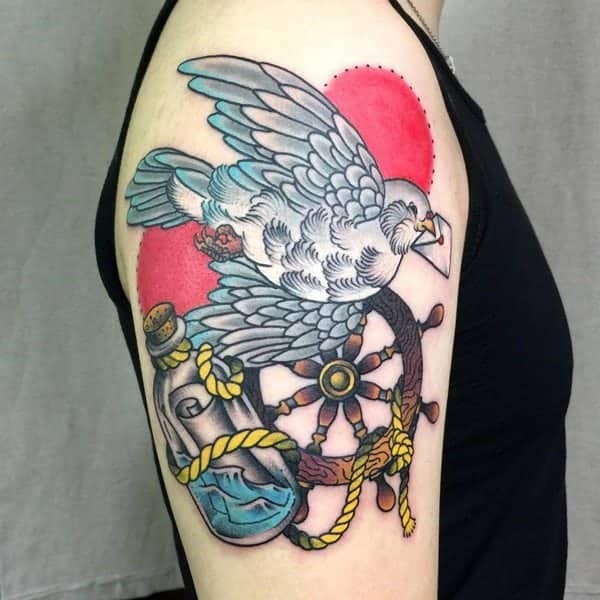 A great tattoo is truly unique with simple imagery. 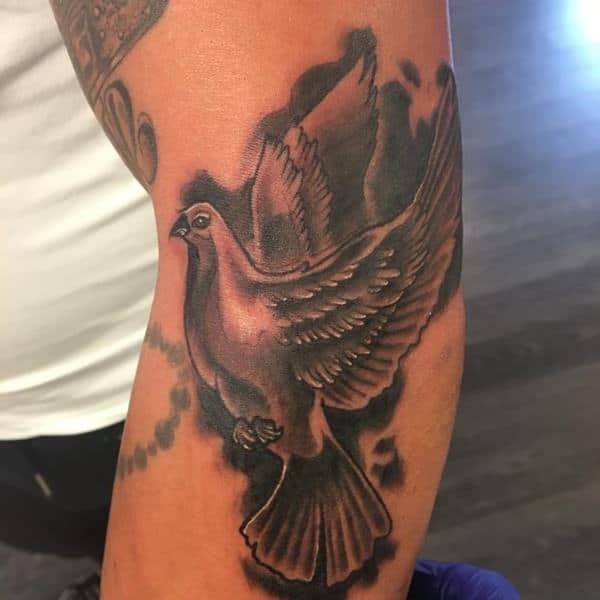 This is a very detailed image of a flying dove. It’s gorgeous. 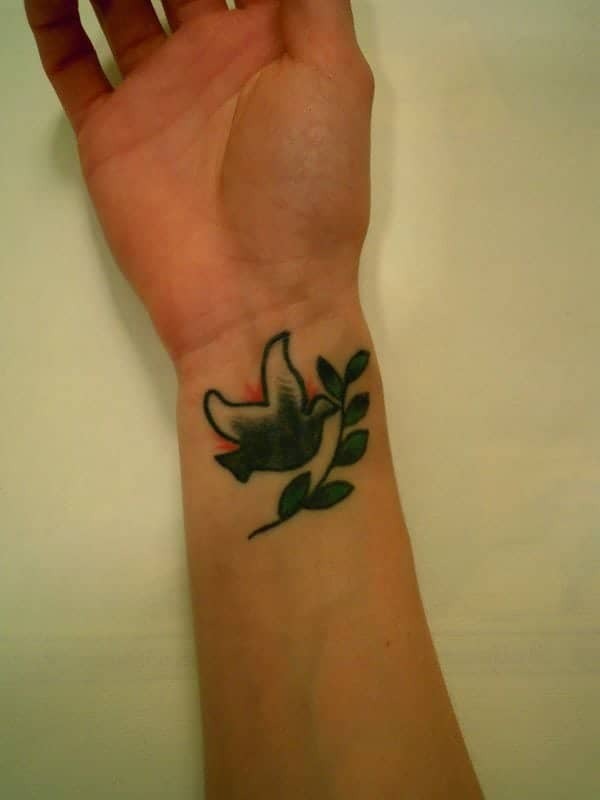 There is a dove underneath the praying hands. 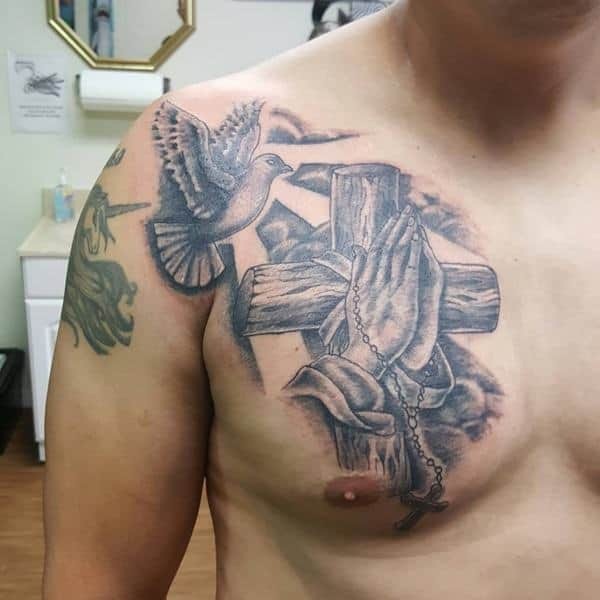 This is obviously a religious design. 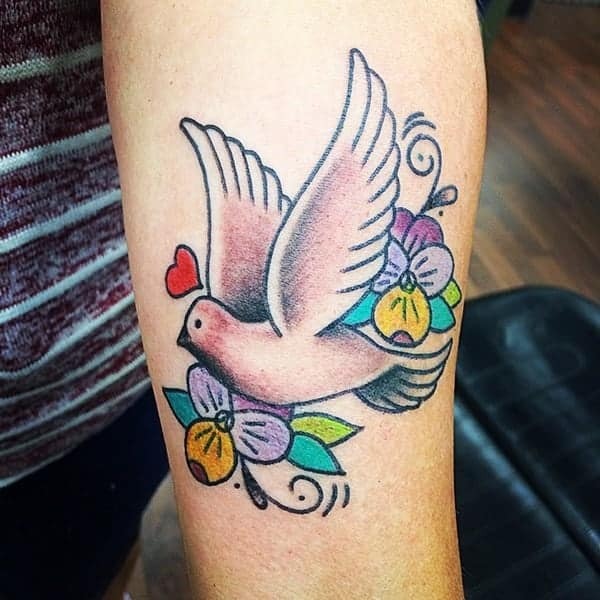 We love these watercolor designs of the dove. The colors are extraordinary! 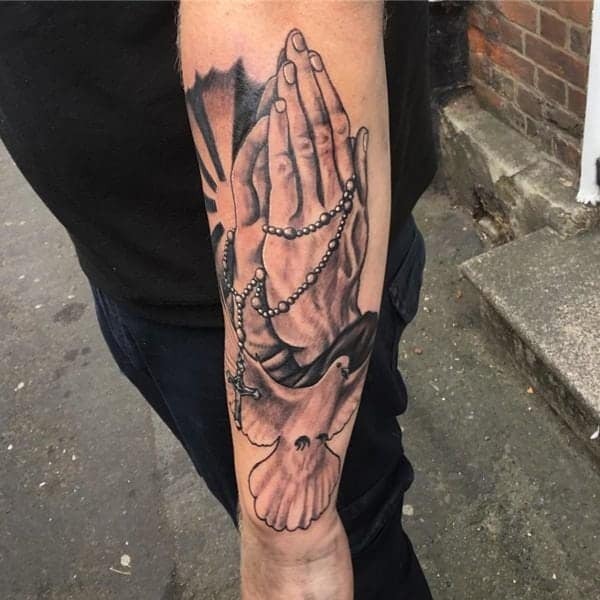 Another example of a tattoo design that has some religious elements to it. 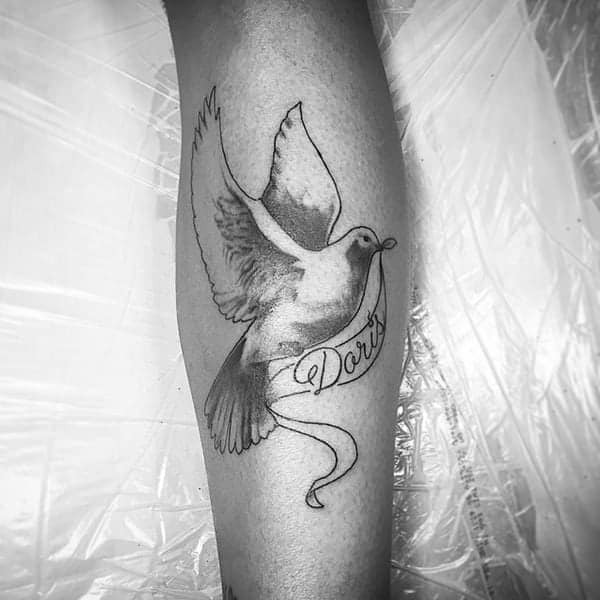 A simple dove without a lot of detail but it sure is cute! 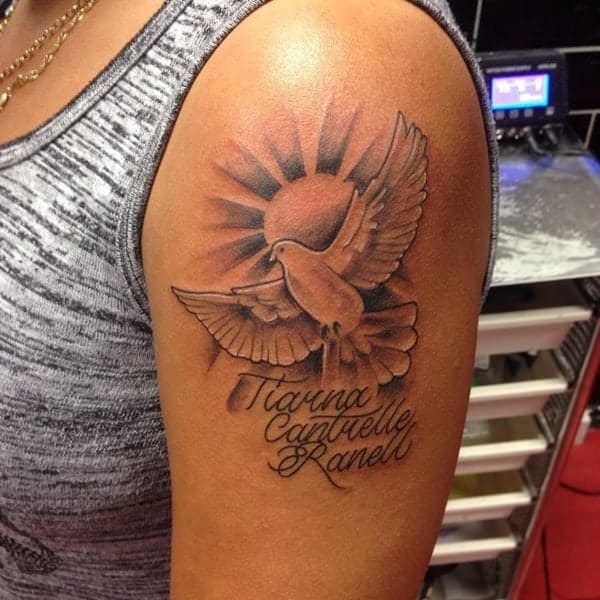 A great image of the cat of releasing doves from the hand. 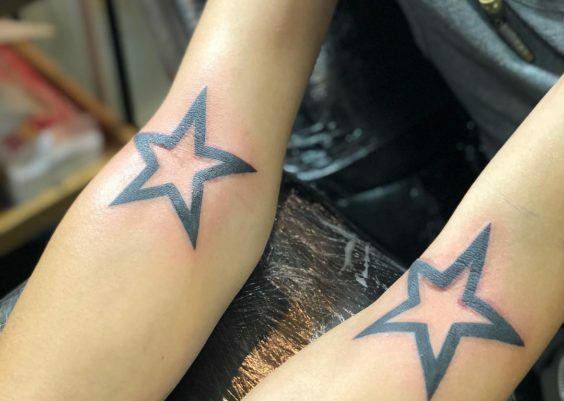 It usually represents a new start in life. 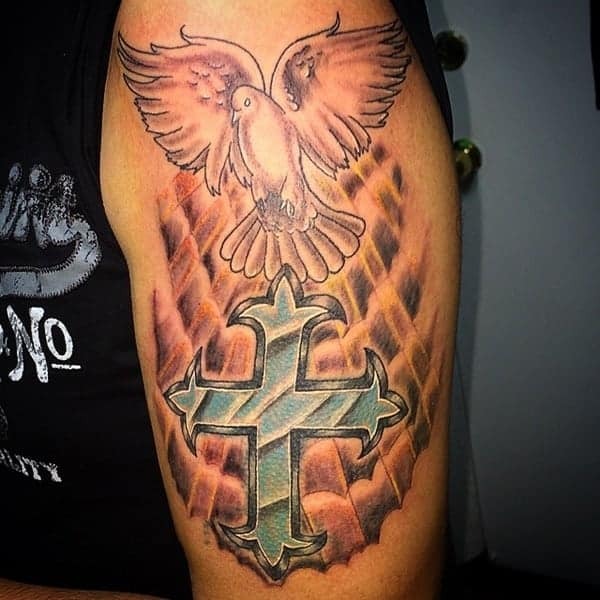 A dark and detailed image of a dove and a cross. If you are a believer, then you are sure to love this image. 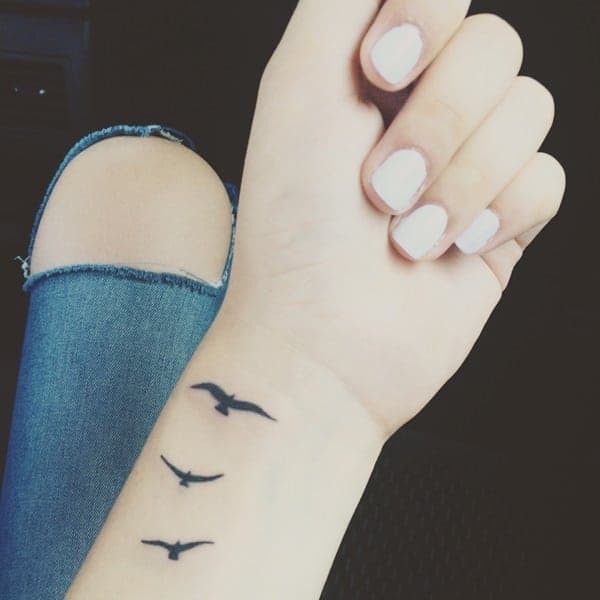 A simple design of a flying down and a message in another language. 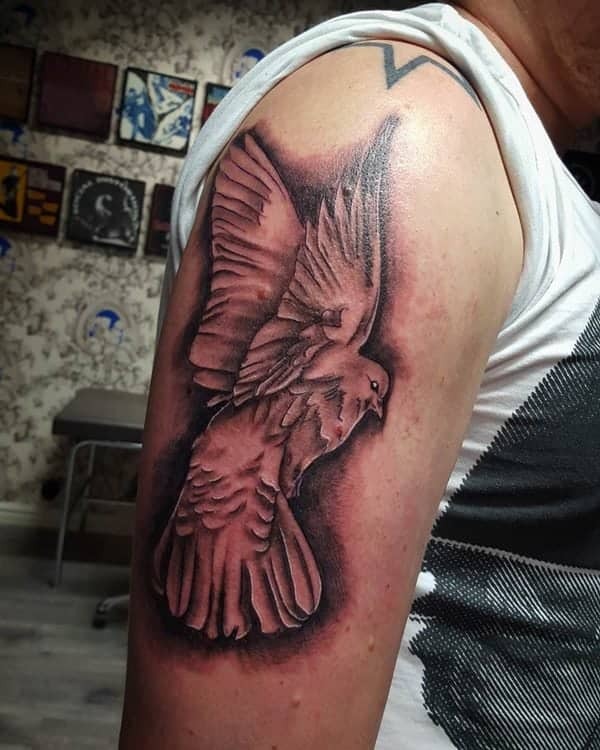 If you love doves, then you are sure to love this dark image. 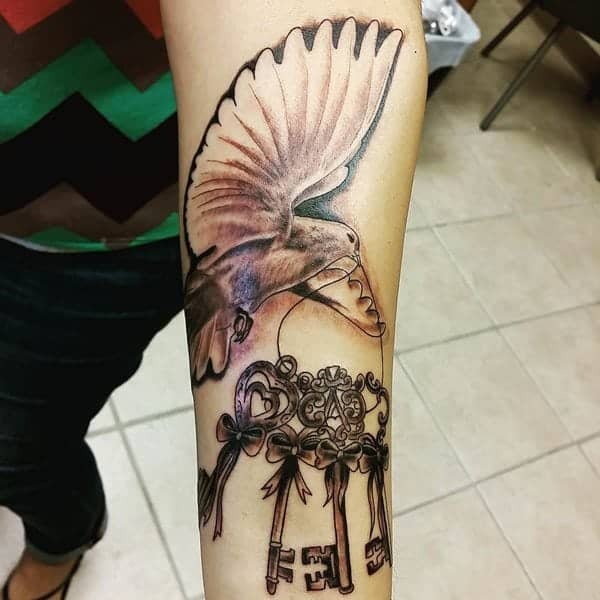 A wonderful image of a dove that has some ribbon wrapped around it. 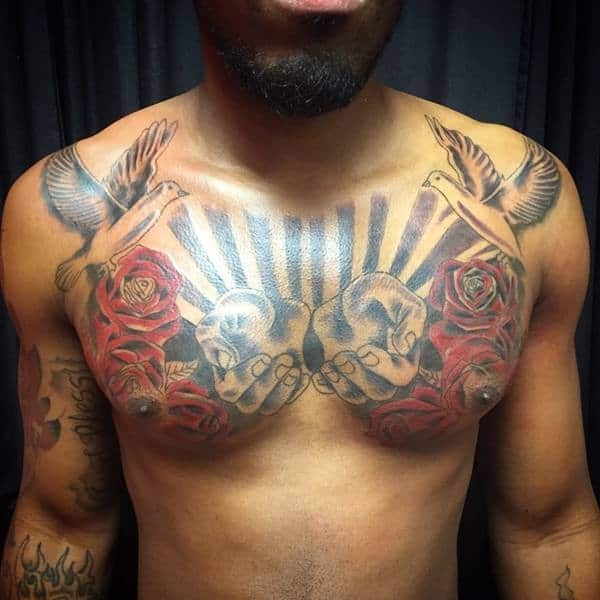 If you are looking for a different tattoo, then look no further than this tattoo idea. 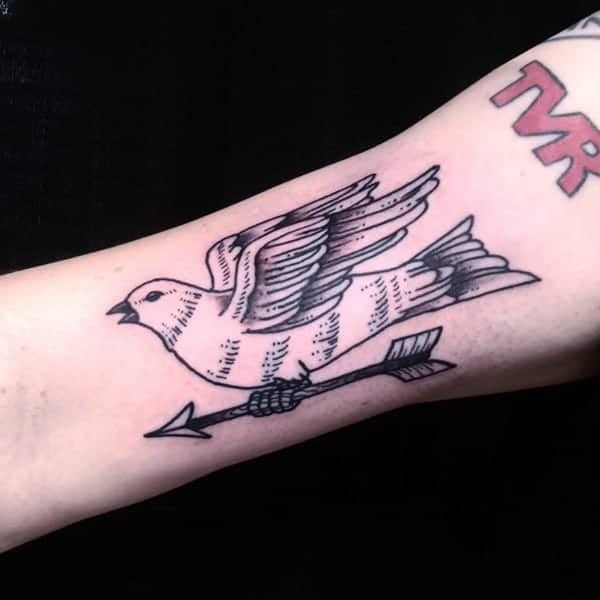 A simple dove design that is carrying an arrow. 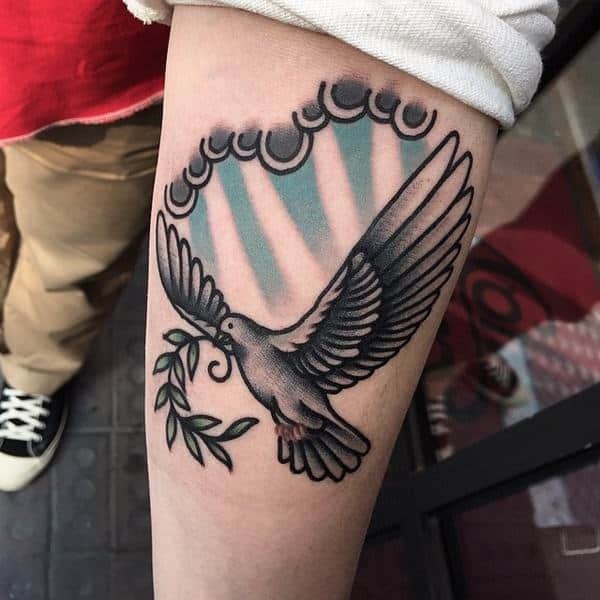 A simple design but one that has a lot of impact. Another religious image and this one are full of color. 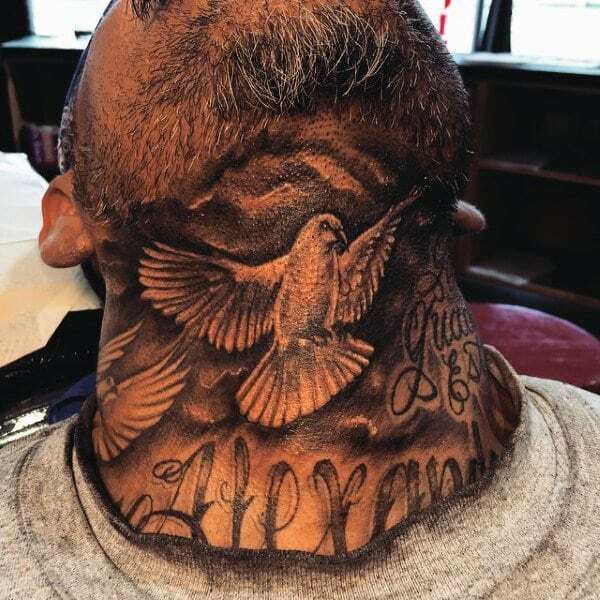 If you are looking for a large back tattoo, then look no further than this. 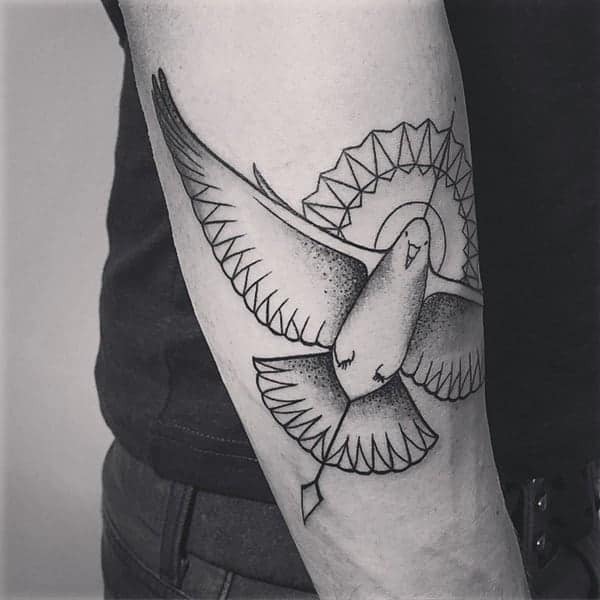 A simple design but one that has a lot of character. 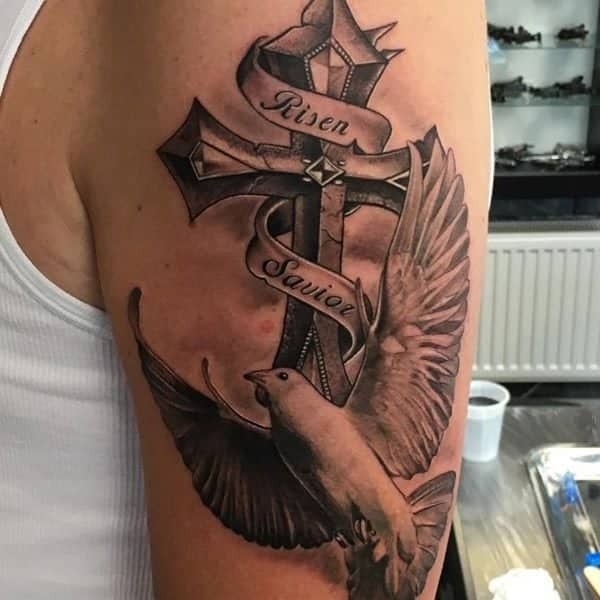 It looks like this gorgeous dove is flying from above and landing on a cross. This image is very symbolic. A good image that is truly unique and wonderful. A creative design that has some really pretty colors. 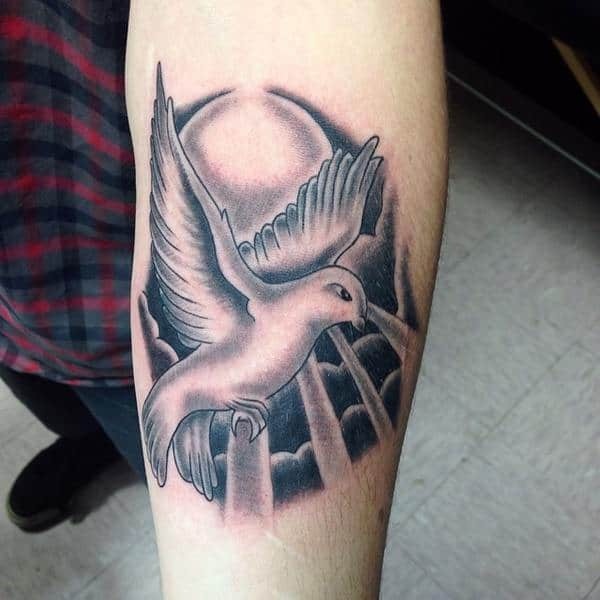 A dove that has a bit of color to it and there is a setting sun in the background. 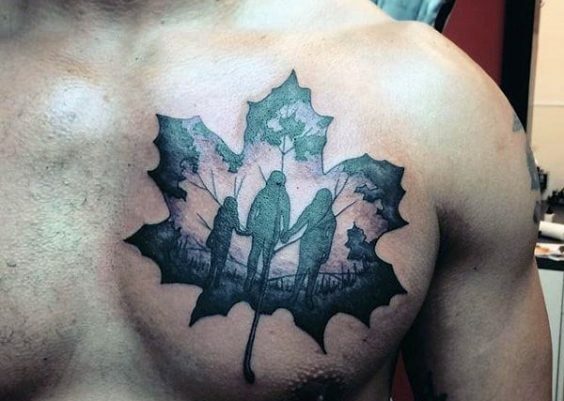 If you want to have some symbolism in your tattoo, then this is a really great image. 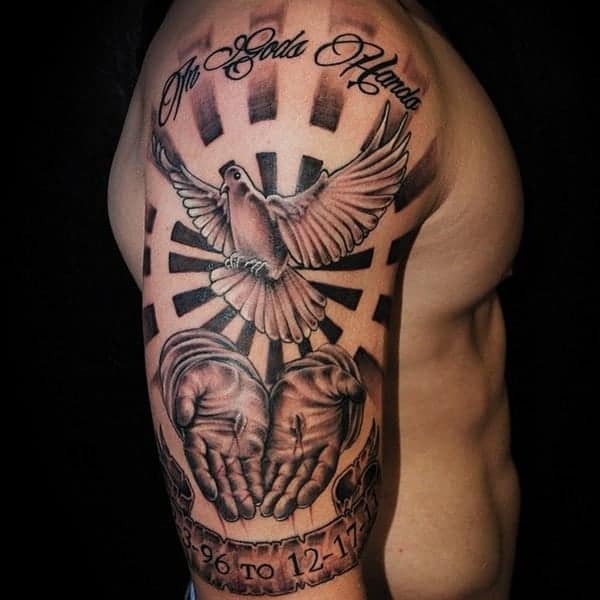 A great design that you are sure to love if you want to represent God’s love. This is a sweet image that you are sure to love for a long time. 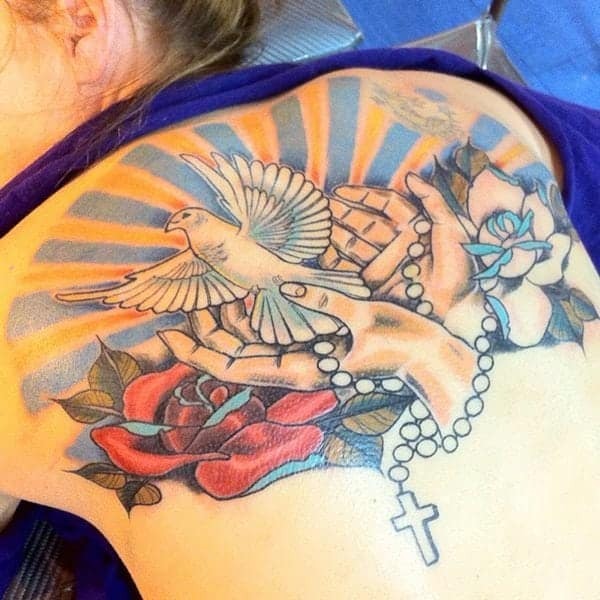 A great tattoo design of a woman and her dove. 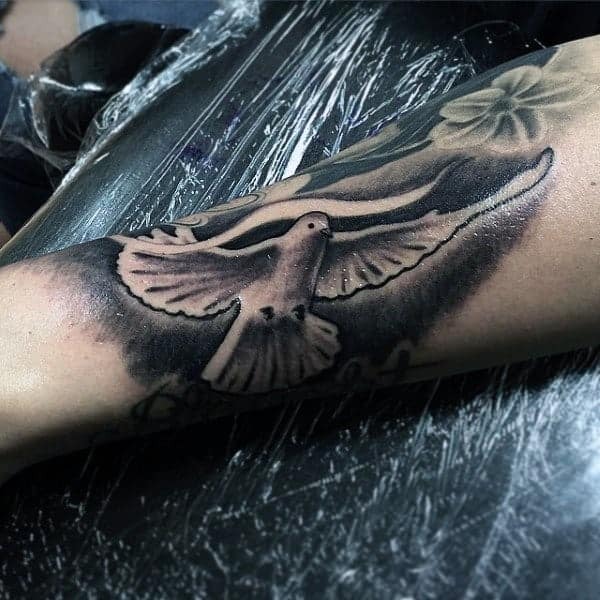 These doves are flying down the aim; these are gorgeous images. 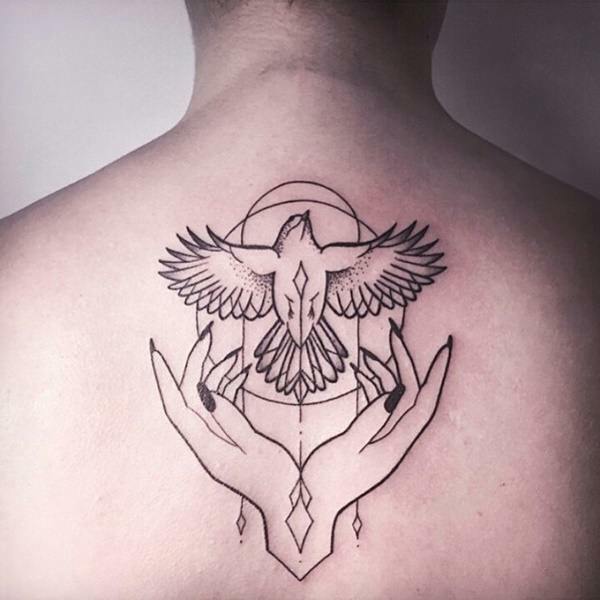 Geometric designs are so popular these days and this one is great because of the dove. 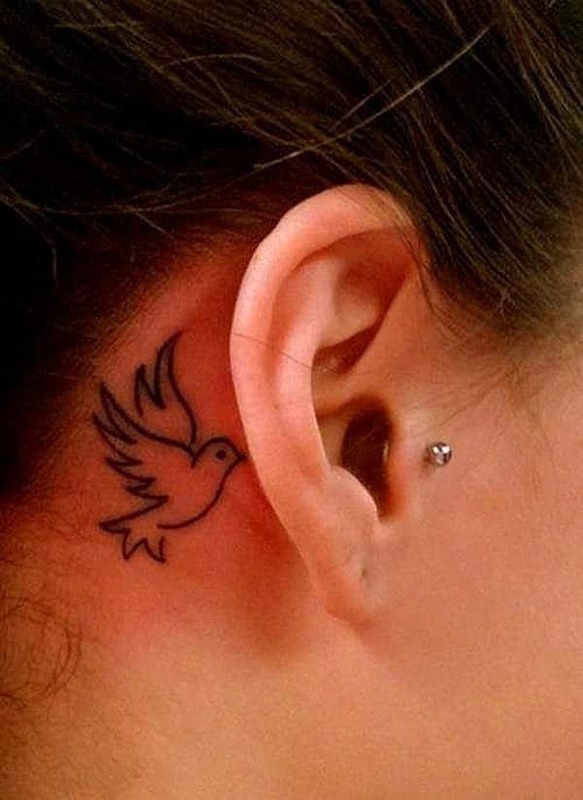 A great dove that is simple and wonderful. 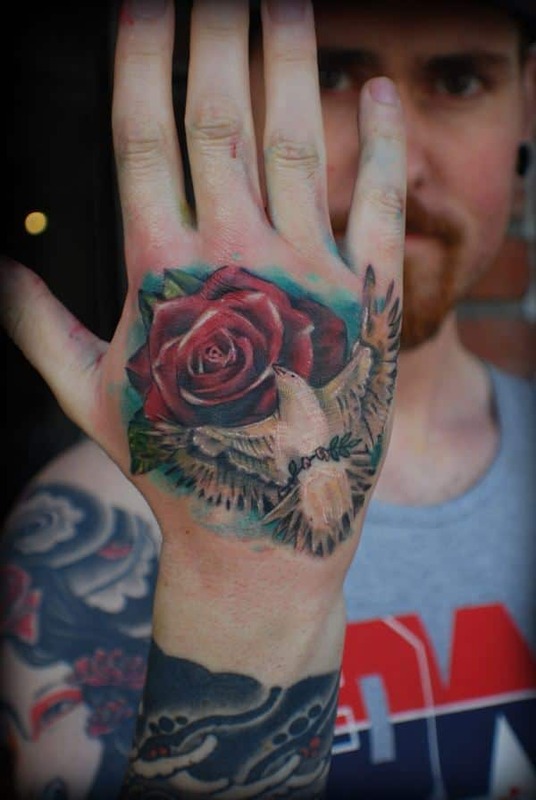 This dove and rose are very detailed and they are gorgeous images. A great image that is one for the books. The outline with this one is really crisp. 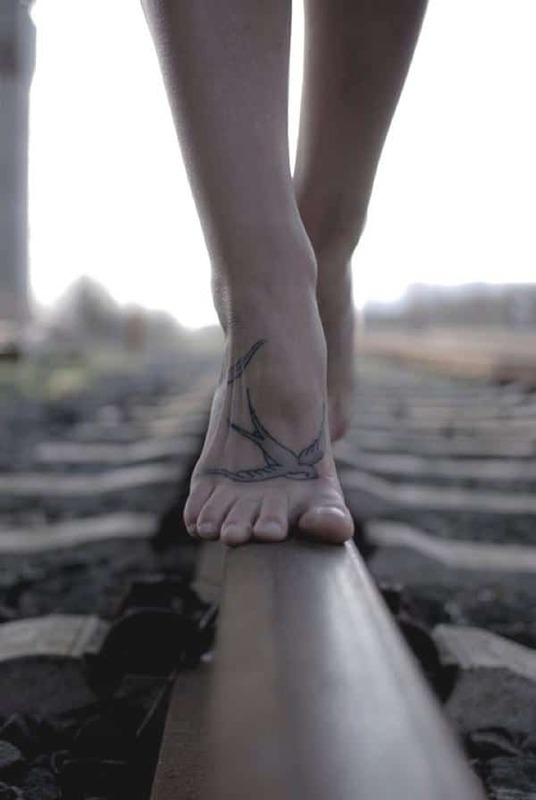 A great tattoo image that you are sure to love because it’s small and adorable. 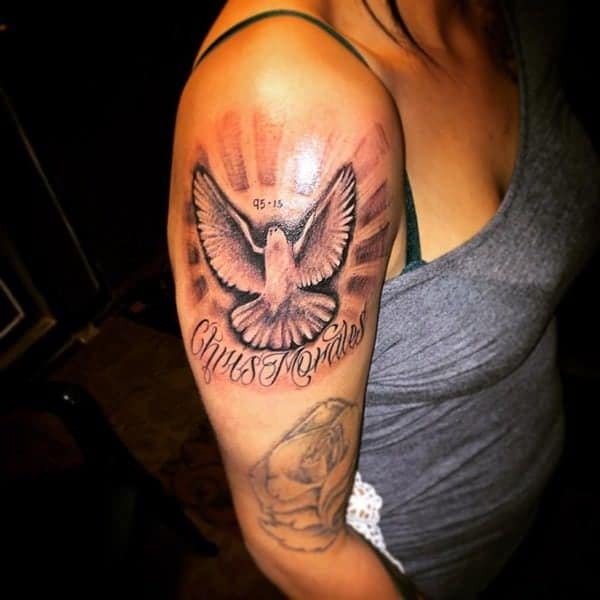 A great tattoo of a dove that has some ornate imagery to it. 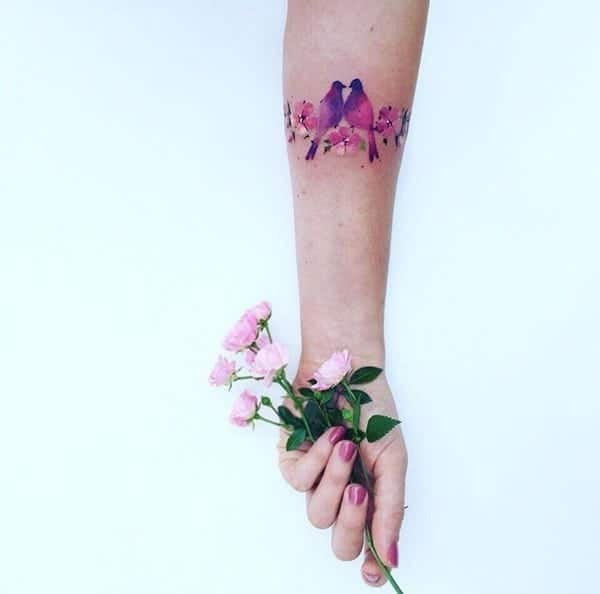 A gorgeous tattoo that you are sure to love. 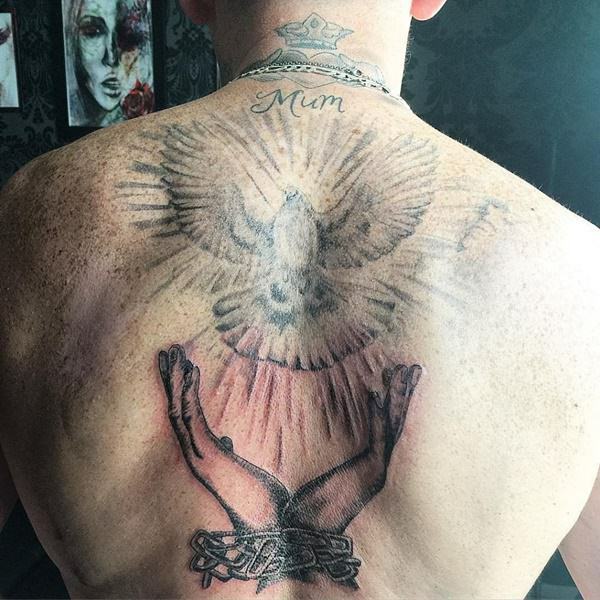 This gorgeous dove back tattoo has some symbolism for the owner in regards to his mom. 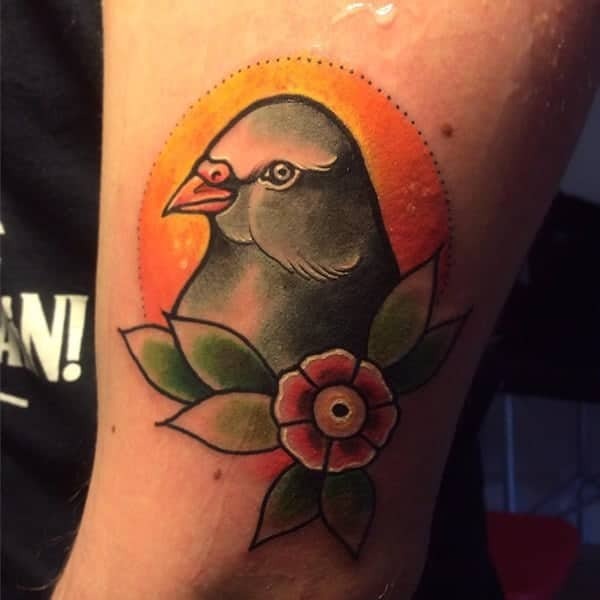 This image of a dove is a great neck tattoo because it’s dark and colorful. 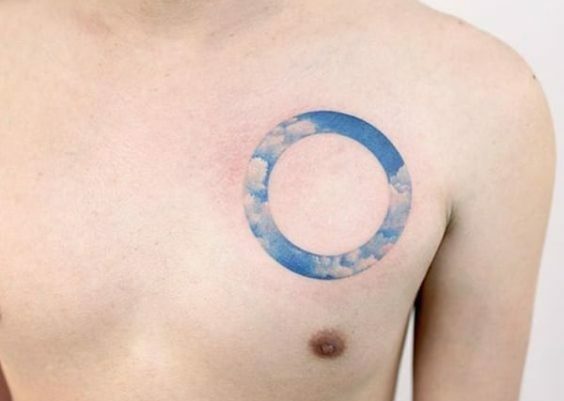 A great design that you are sure to love because it’s a simple design but has a lot of symbolism to it. 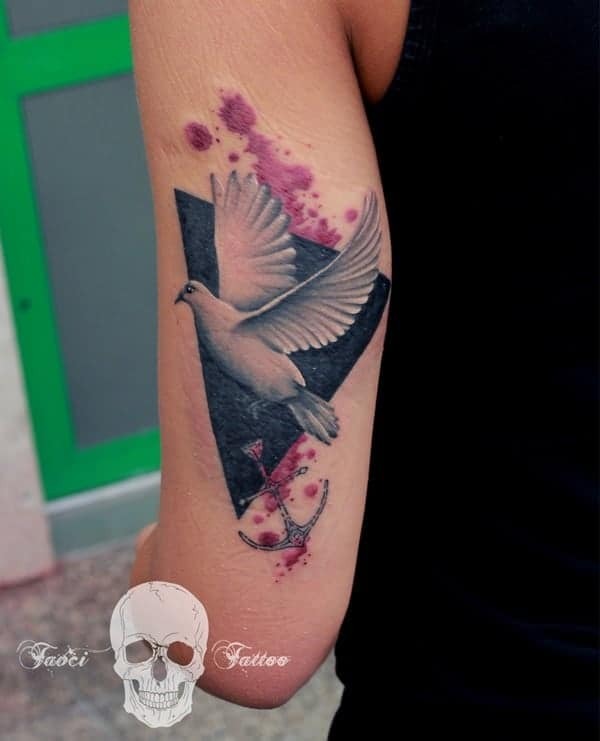 A gorgeous dove that is flying with the wings spread wide. 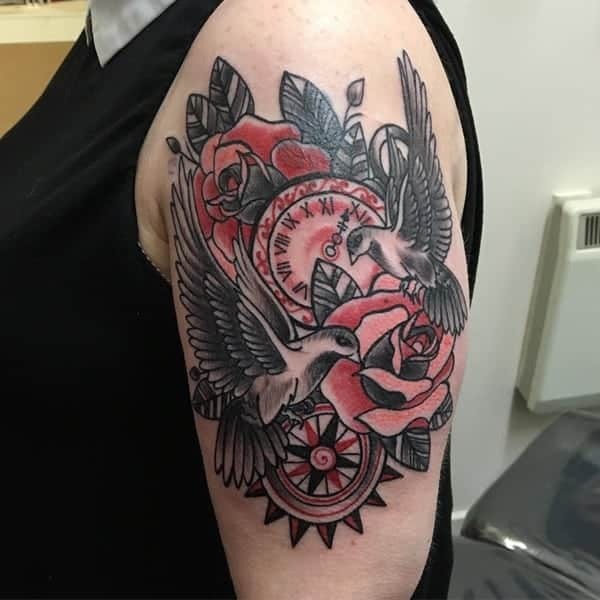 We love this gorgeous design. If you are looking for a small image, then you can’t go wrong with this one. 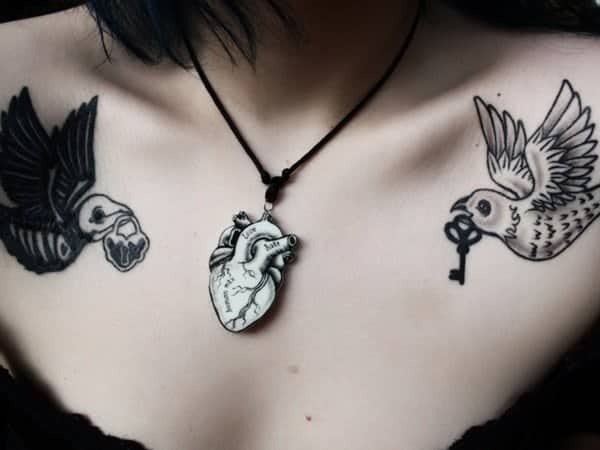 It’s small and simple and is perfect for a collarbone tattoo. 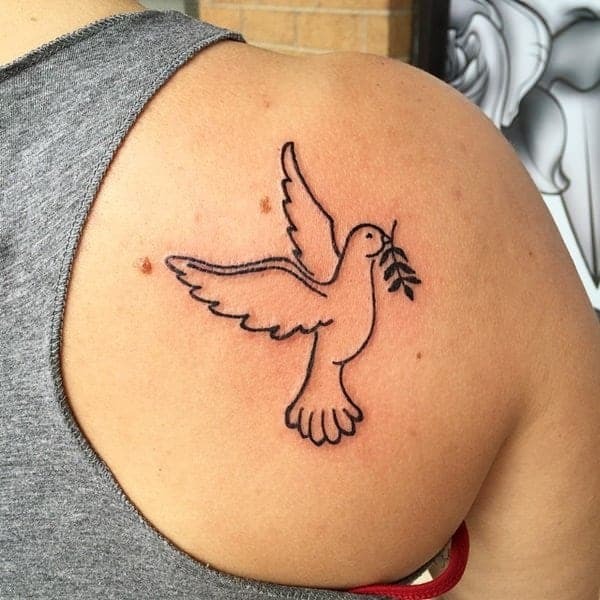 Many people use the dove tattoo to represent the passing away of a loved one. 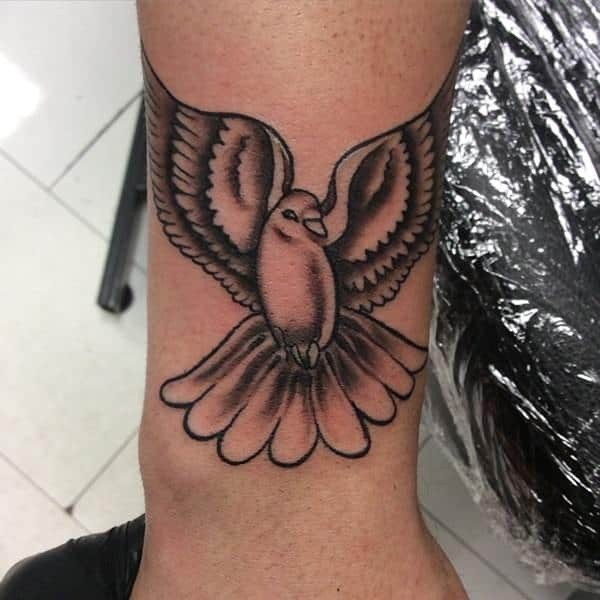 A dove on the foot is a creative design. 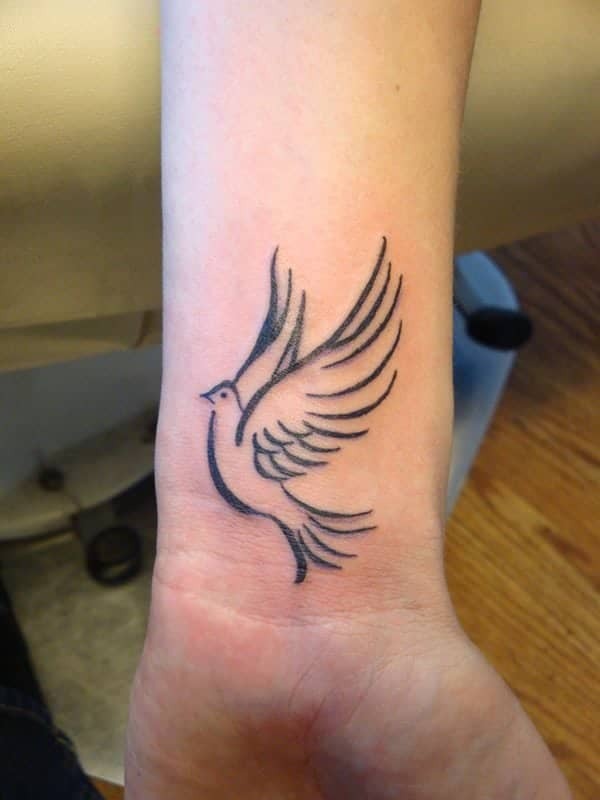 The dove represents peace, so it looks perfect with the peace sign. 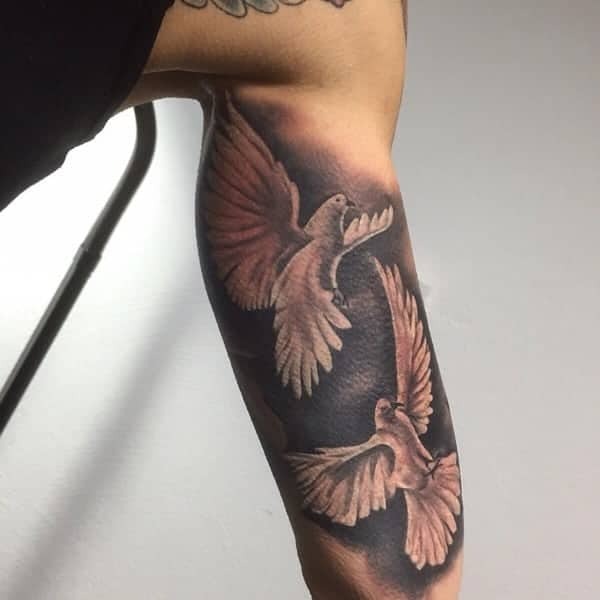 These gorgeous doves are flying all over the back. 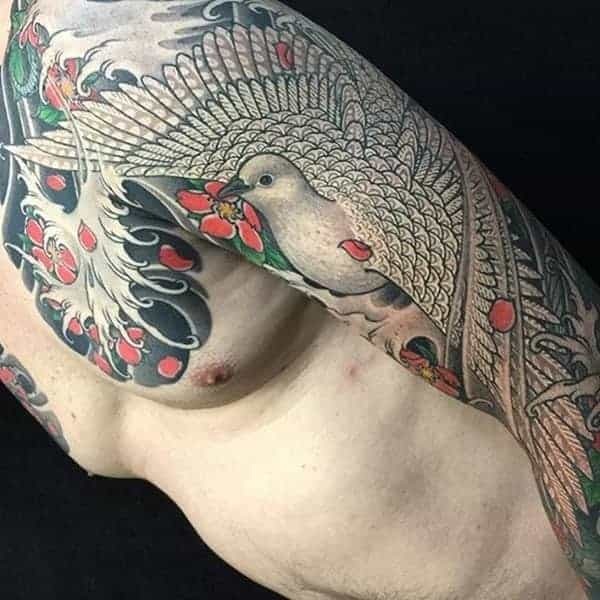 A very beautiful white dove to cover the shoulder. 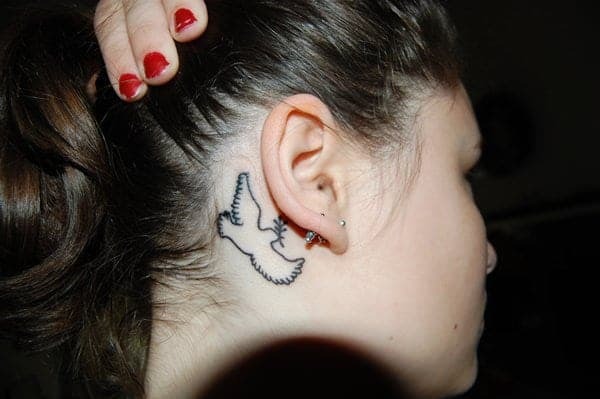 A sweet tattoo that fits nicely behind the ear. 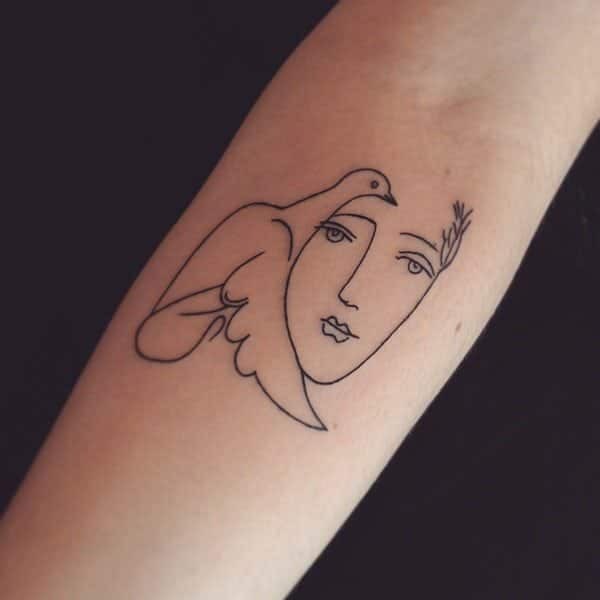 A sweet image that is very common with dove tattoos. 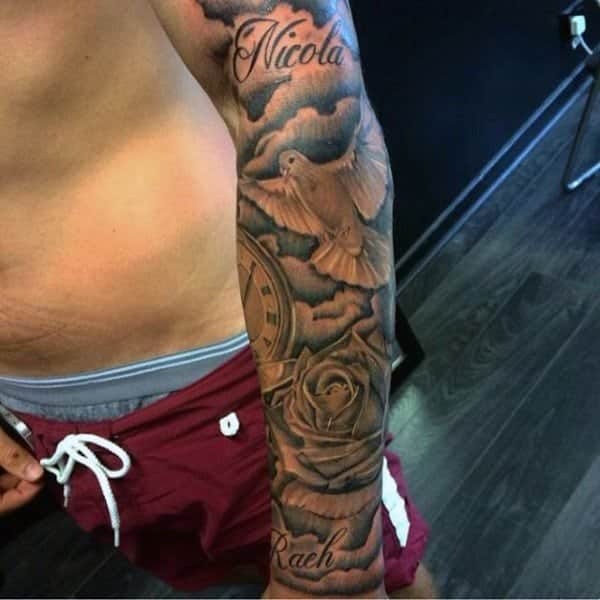 A great tattoo that covers the whole arm. 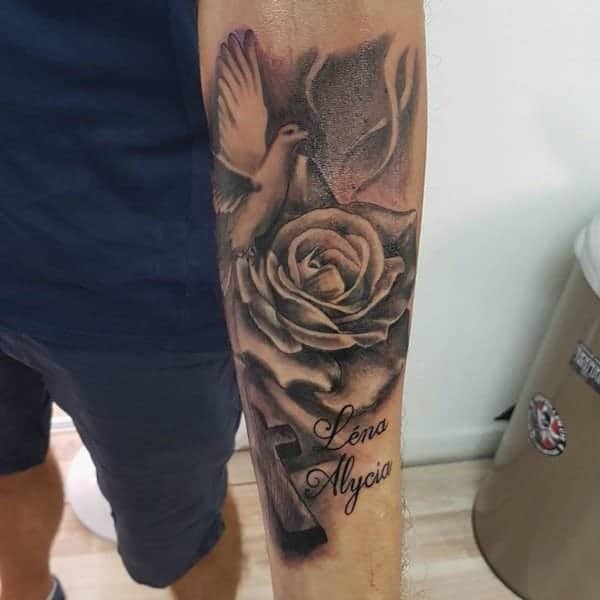 A great tattoo design that you are sure to love. 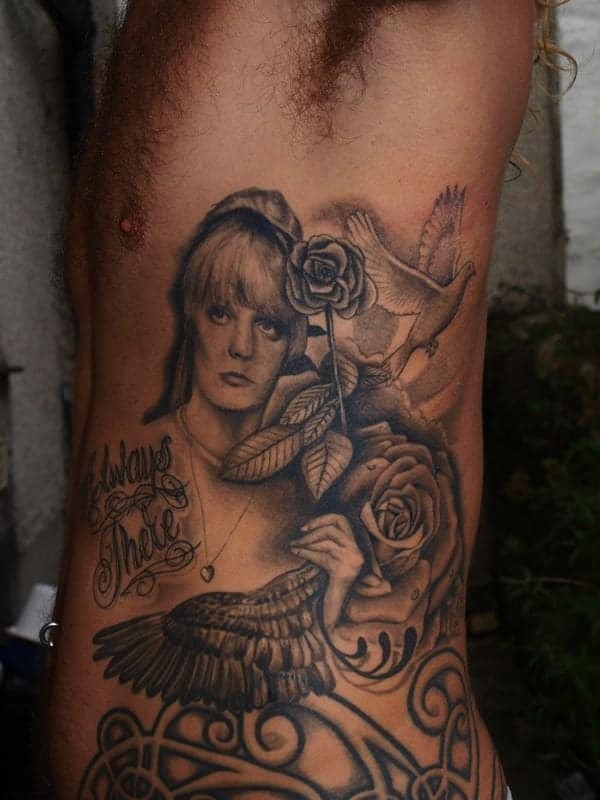 A great tattoo that has some pretty great images to it. 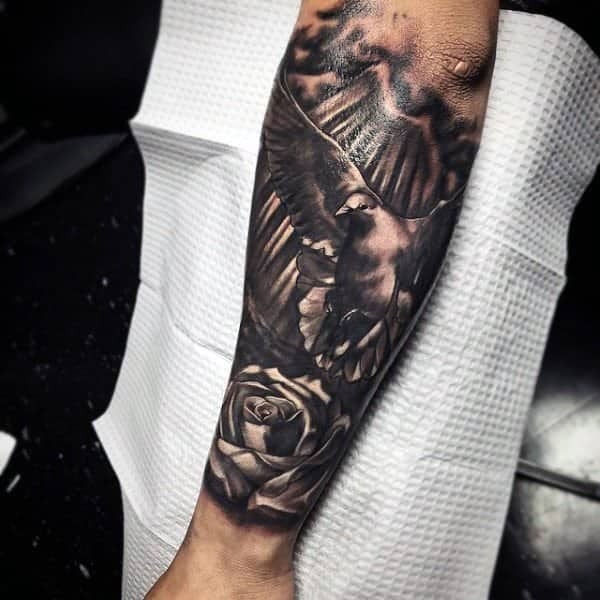 A great tattoo that covers the whole sleeve and it has some dark images to it. 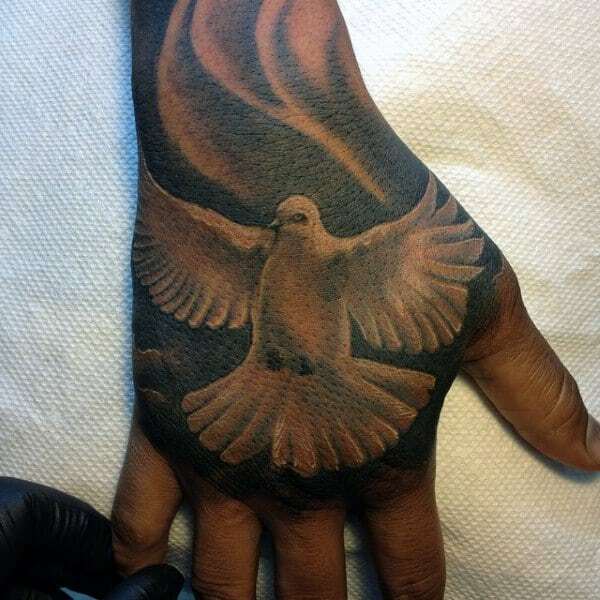 This shand design is part of a sleeve and it looks wonderful with the dove. 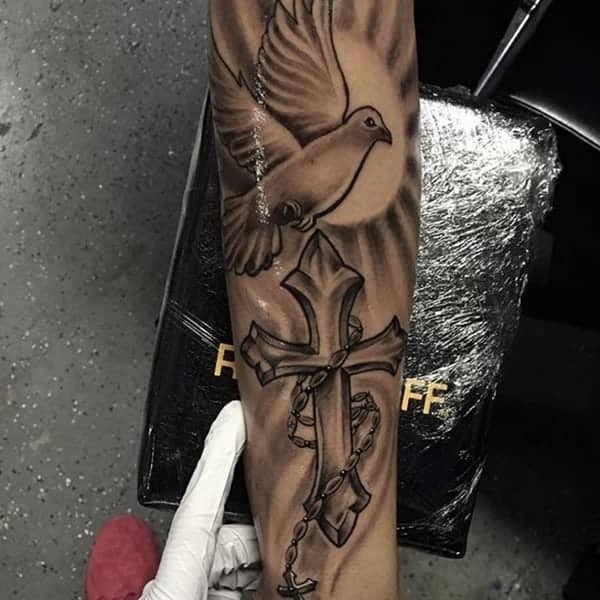 A sleeve design that has a dove and other religious elements. 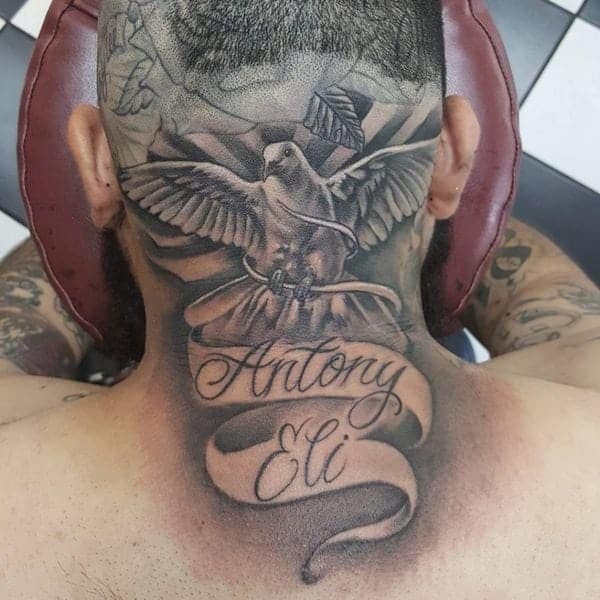 A dark design that you will love on the neck. 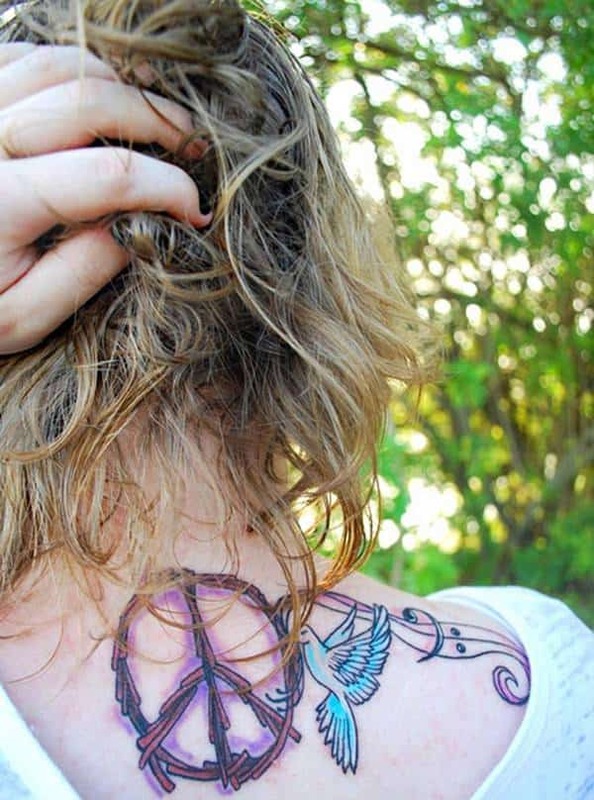 This tattoo is truly wonderful looking because it’s awesome. 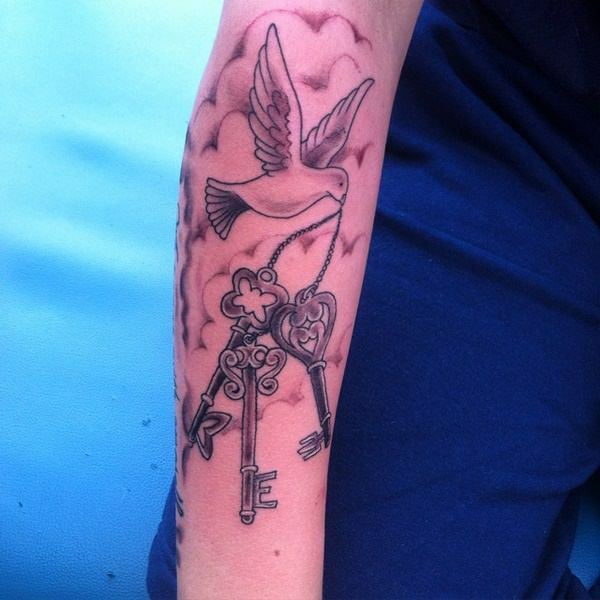 A design that has simple elements to it, but it’s very pretty. 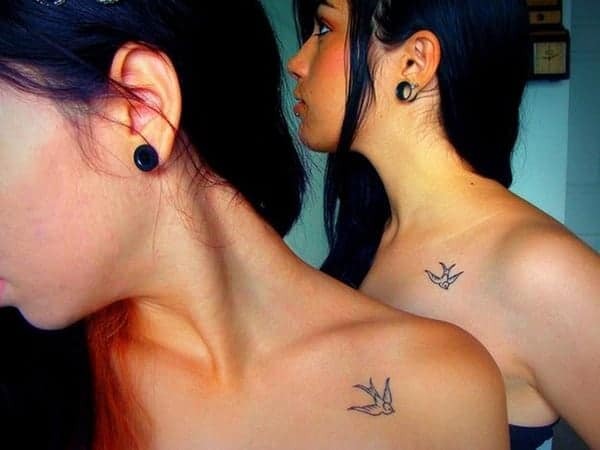 A great tattoo design that you can match with your friends. 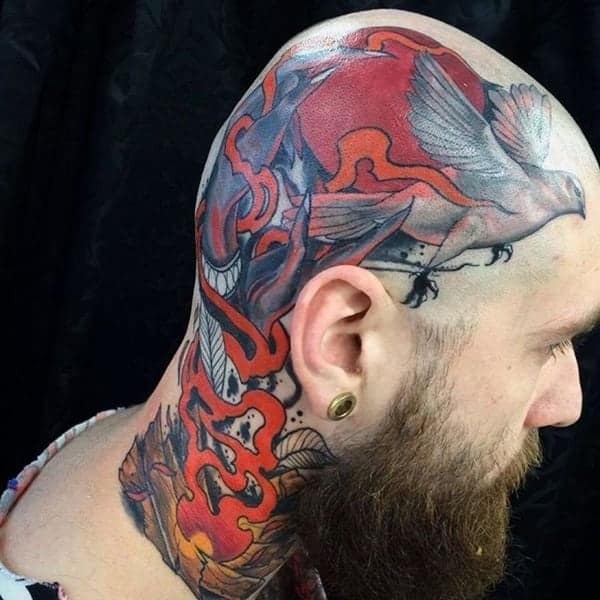 A large tattoo that has a lot of elements to it. 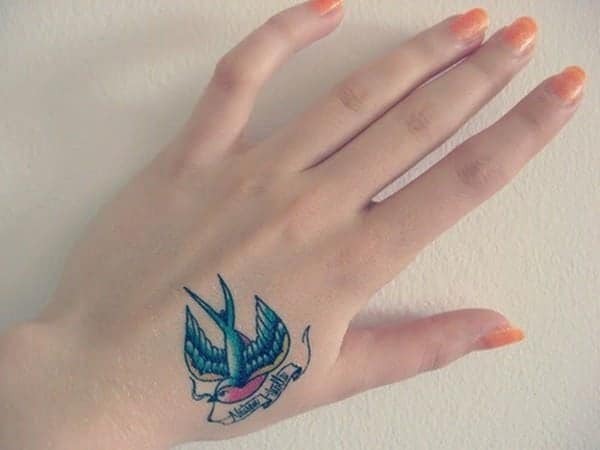 A small hand design that is full of color. We love the splash of pink in the background. 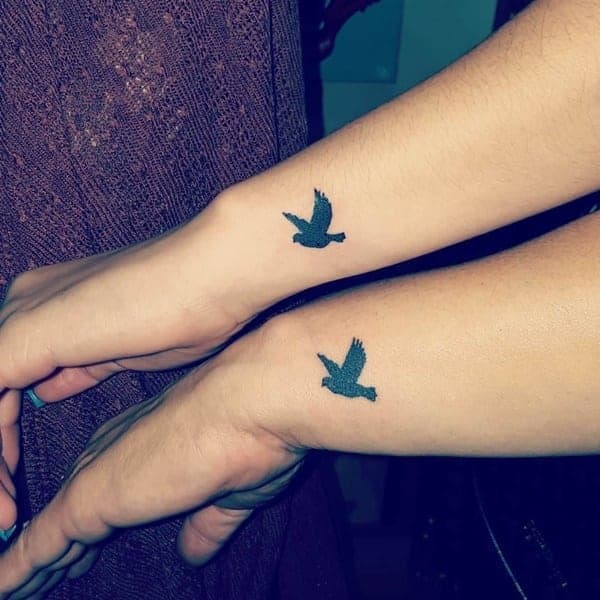 A simple image of silhouette doves flying. 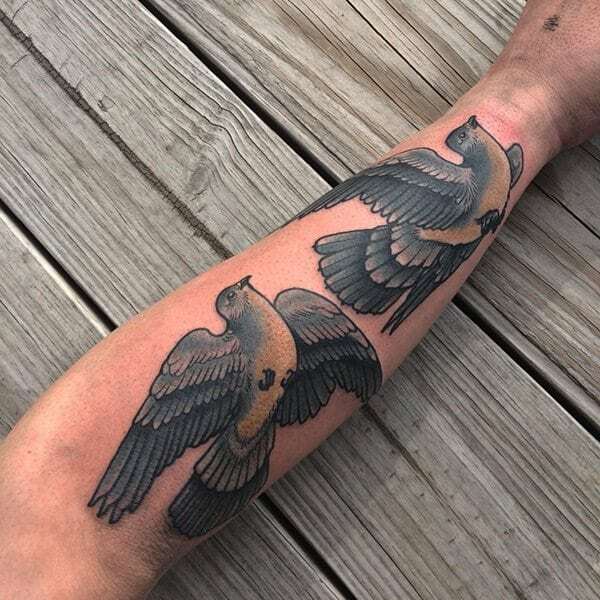 A great arm tattoo that has some lovebird doves with some amazing colors. 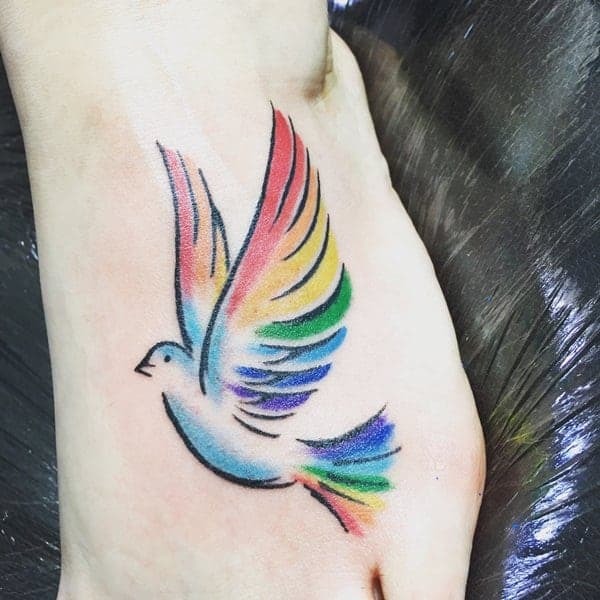 This dove has some rainbow colors to it. 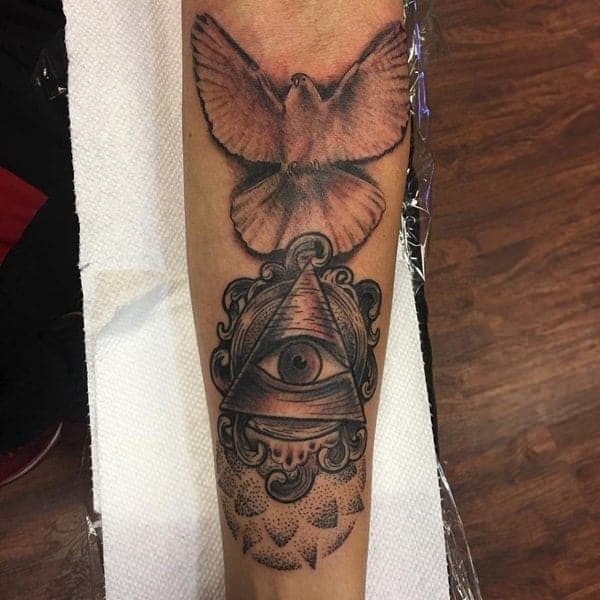 We love these designs. 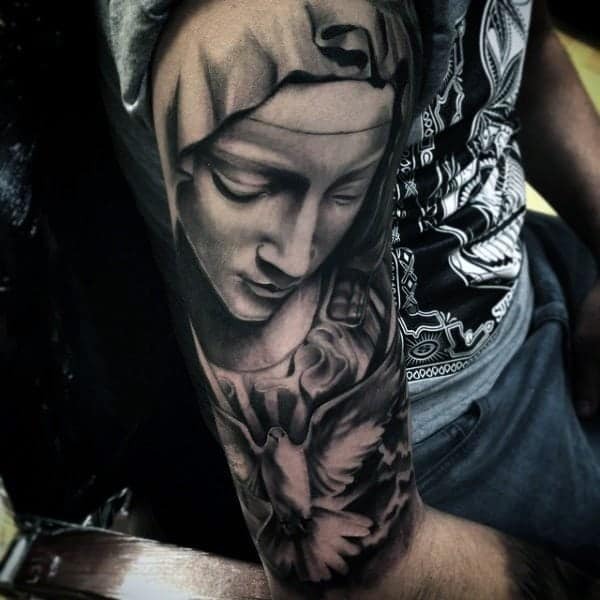 A sleeve that is truly wonderful. 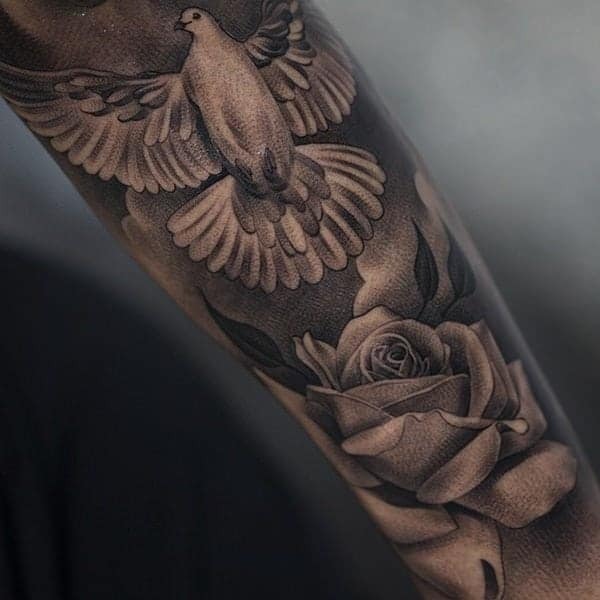 A dove on the wrist makes for a unique design. A wonderful design that looks great on the wrist. 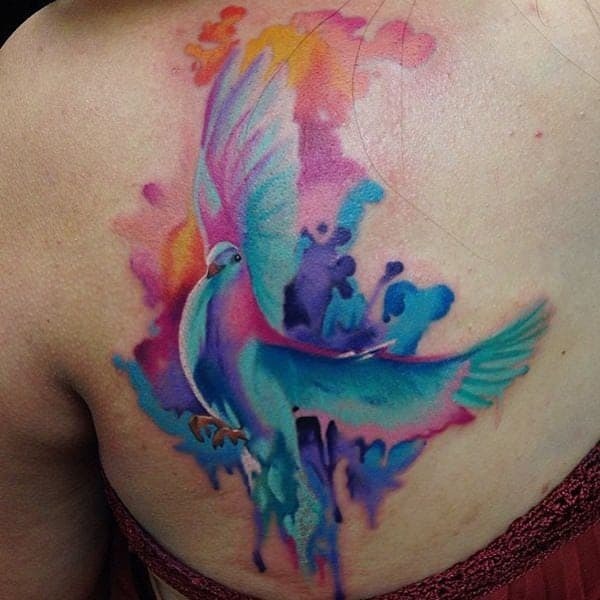 A great tattoo design that is full of amazing colors. 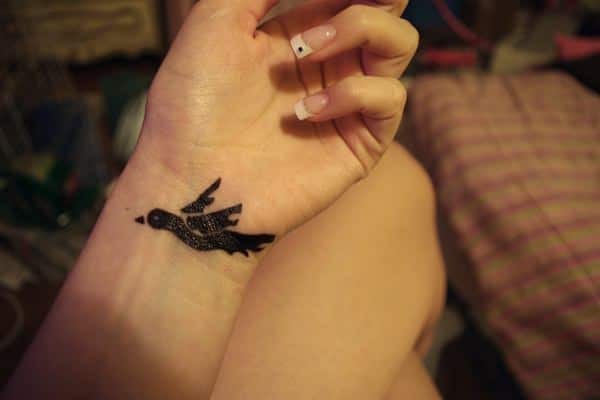 A small tattoo is sure to bring you happiness. 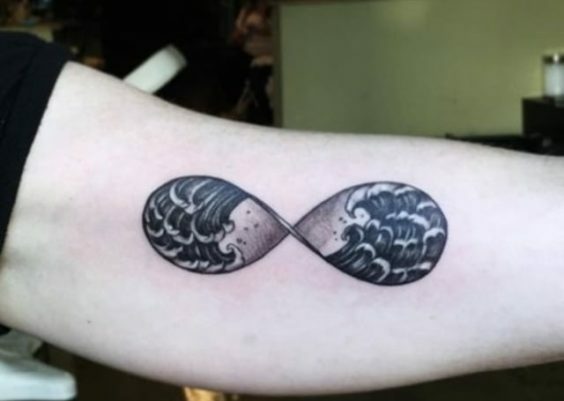 A simple tattoo design with some great shading. 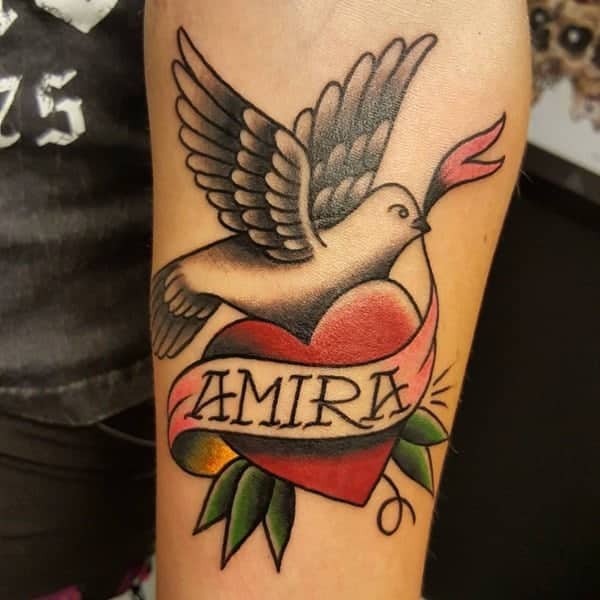 You are sure to love this creative design with lots of colors. 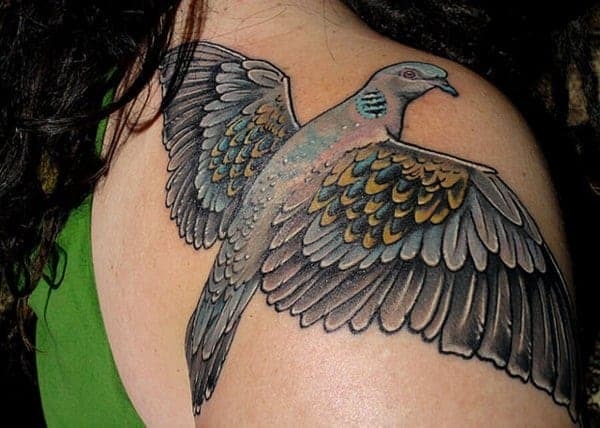 A solid dove design that is truly awesome. Not everybody wants a head design, but if you are game for it, then this colorful image is sure to please you. Sleeve designs are always gorgeous images. 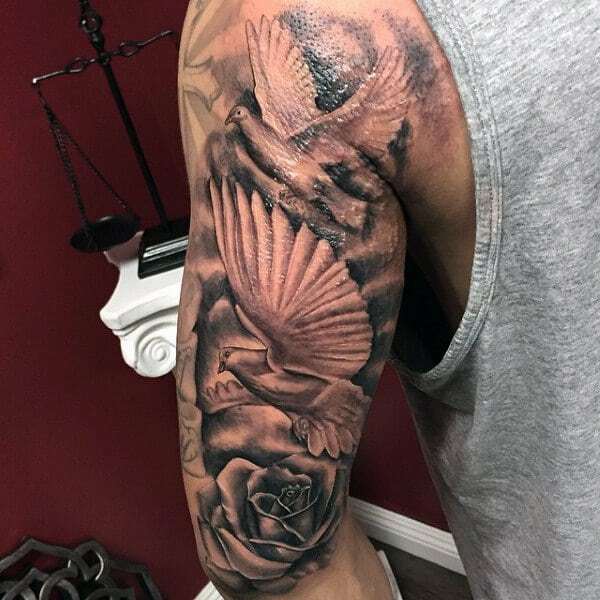 This tattoo is wonderful on the shoulder. A great design that you are sure to love. The dark and light side are coming together. 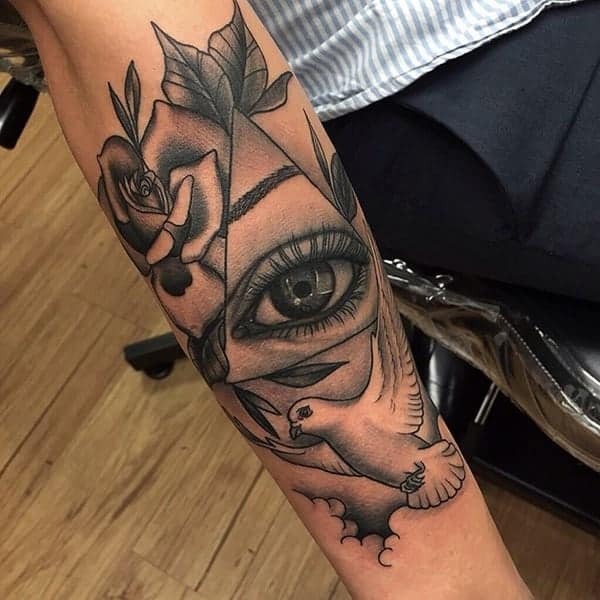 We love this wonderful design. 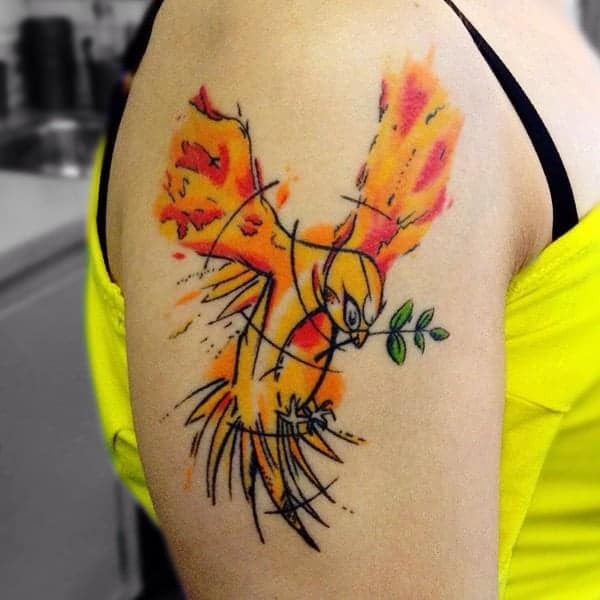 A wonderful tattoo design that has a bright red sun in the background. 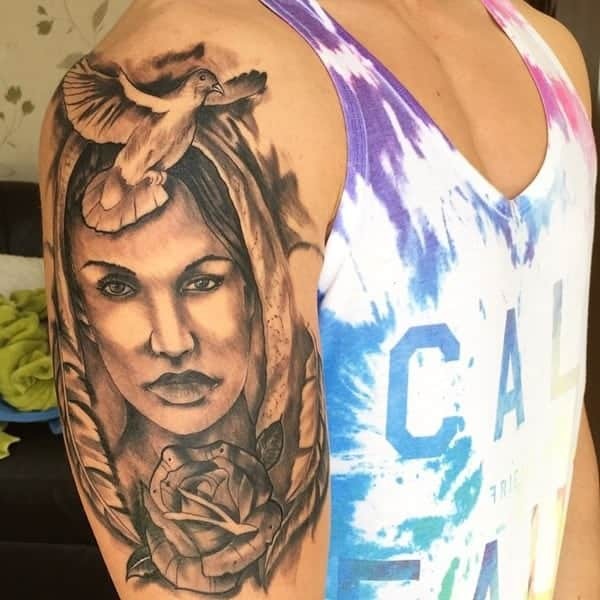 What a stunning tattoo image! 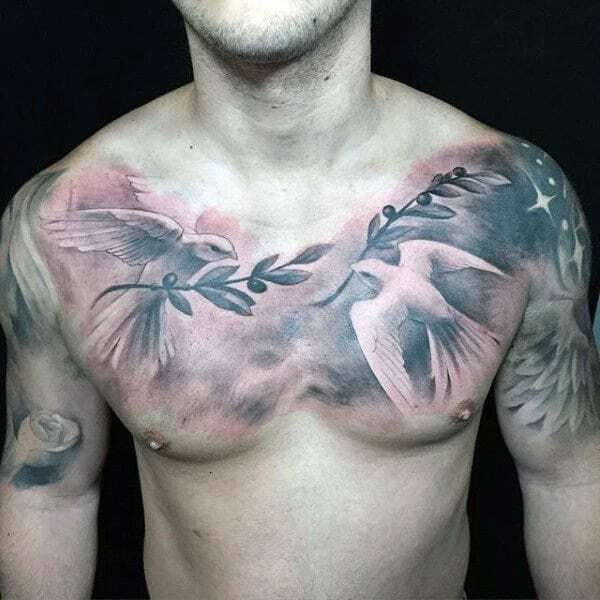 A great tattoo design that covers a lot of space.